It takes a lot to impress me. Gigantic, expensive sets? Lavish costuming? Pyrotechnics? Lots of flashing lights? Pfft, whatever, any rich old sod can chuck a bunch of money onstage. What really pushes my buttons is genuine talent: theatre that requires everyone involved to be at the absolute top of their game and permits no slackness. Operation Crucible is a perfect example: thrumming like the engine of a supercar and ticking with the precise rhythms of an atomic clock. Set in Sheffield around 12 December 1940, we experience the Blitz from the perspective of four steelworkers. They are Arthur (James Wallwork), Bob (Salvatore D'Aquilla), Tommy (playwright Kieran Knowles) and Phil (Paul Tino). All four are distinctive in their own right, their personalities running the gamut from brash confidence to social awkwardness. Yet it's as a unit that they shine, moving in mechanical synchronicity as they work lumps of red hot metal, completing each others sentences and winding around one another like birds in flight. From the first minutes, their fierce civic pride shines brightly. These men have the grit of Sheffield stamped into their bones, they work the same industrial jobs as their fathers and see the fruits of their sweat in every inch of the city's architecture. During wartime their efforts are even more vital, creating the cogs of the Allied force that'll beat back the Nazi war machine. But tonight it's the Nazi's turn to strike. As air raid sirens change from yellow (bombers spotted) to red (bombers bombing) the men scramble to safety. They find it in a shelter at the Marples Hotel. But with a crashing boom and a blast of hot, dusty air they find themselves in total darkness. The other people in the shelter are killed as the ceiling collapses, and the four are left buried alive, awaiting rescue or death. This is conveyed with blank concrete walls and four stools. Everything else exists in the mind of the audience and the words of Kieran Knowles. Fortunately this language is so evocative that you practically hear the hiss of the glowing metal and taste the acrid dust hanging in the air. There's a breathless, excited quality to the delivery, as if the dialogue is tumbling unedited from the character's minds. Achieving this speed and precision looks hard. The rat-a-tat rhythm leaves no room for mistakes, the narrative thread bouncing between all four performers at tremendous speed. Merely to recite this play would be a challenge, yet these four imbue each miniature line with character development. By the end, though the men are dressed identically, speak with one voice and have similar personalities - they're all individuals. These are four actors at the very top of their game, all equally talented and able to draw us into their world. In the buzz of their steelwork you taste the thrill of heavy industry, workers wrenching girders and plates from raw elements. In the fragments of their home lives we feel a familial love, the men simultaneously respectful sons and loving fathers. By the time they're trapped we know them so well there's an intense dread - the low lighting and growing desperation inducing a suffocating claustrophobia as their situation worsens. Yet they persevere, drawing strength from their unity and mutual respect. We gradually understand that the men's relationship is a microcosm of British life during the Blitz, the citizenry drawing support from one another in a situation where death can arrive at any moment. Most strikingly of all, it gives what feels like a credible window into the past. The fingerprints of historical research are all over the dialogue, meticulous research supporting the emotional story like a scaffold. We can get a sense of what it was like to be there, to see the world through these eyes. From a contemporary perspective we also feel a sense of loss, that Thatcher's closure of Sheffield's steel industry robbed the city of identity, purpose and pride. 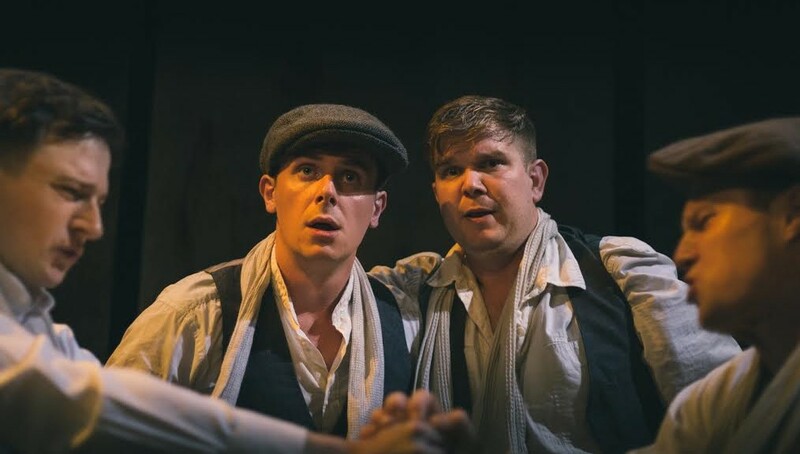 After premiering at this theatre in 2013, Operation Crucible has subsequently toured the nation to much acclaim, now returning to Finborough Road for a victory lap of sorts. It's well earned. Highly recommended. 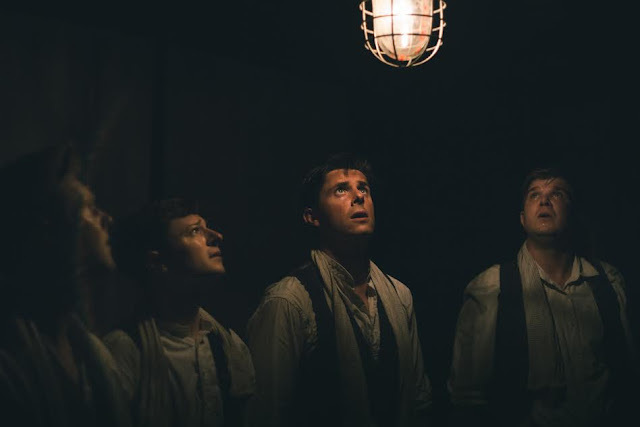 Operation Crucible is at the Finborough Theatre until 22 August. Tickets here.